According to Newsroom NZ’s Simon Louisson, I am “the US Consultant behind the Wellington bus nightmare.” Wellington, New Zealand is having some problems with recent bus service changes. I have had no role in Wellington for the last six years, and did not even know the service changes were happening until I read about them in the media, but I, being a foreigner, must be to blame! Jarrett Walker, the US consultant that has united Wellingtonians in their loathing for the chaotic new bus network, has also redesigned Dublin’s network and has met an even more rigorous negative response. The entire article is false and defamatory, so if you read it, please also read this. Through my employer at the time, the Australian firm MRCagney, I did a project for the Greater Wellington Regional Council on the design of the bus network in Wellington (the city only). This work was mostly in 2011, ending in early ’12. My role ended with the completion of the draft network plan. I had no role in how the plan was presented to the public, and when that didn’t go well in 2012, I assumed it was dead. That is always a possible and valid outcome of a public consultation process. This year, a somewhat similar plan was implemented without my knowledge and involvement. The implementation has not gone well, for a variety of reasons, most of them not related to the network design. One of the big ones was a decision to switch operating companies at the same time in a way that changed the drivers’ working conditions, something I always advise against. At it happens, my role in Wellington was exactly the same as my role in the Auckland redesign, which has been rolled out over the last several years to great success. In Auckland, too, I led the original design process six years ago, then had no further role except to offer encouragement. But no facts will prevent Newsroom NZ from constructing me as a cartoon villain, through an astonishing series of blatant falsehoods about who I am and what I believe. Jarrett Walker, head of JWA, is one of America’s foremost advocates of public transport over cars, but he sees the intense reactions of Wellingtonians and Dubliners as a welcome part of the process. His stance opposing ride-sharing has led Tesla manufacturer Elon Musk to call him “a sanctimonious idiot”. My exchange with Elon Musk had nothing to do with ride-sharing. It was about Musk’s insulting and ignorant comments about public transport which I identified as an example of elite projection. And while it’s true that I anticipate negative feedback on my plans, that doesn’t mean my goal is to make people upset, as he seems to imply here. All I have said, in many ways, is what every politician knows: Changing anything will upset some people. Walker takes a very binary view of change. In his blog he says cities should either totally revamp a network or leave it as it is. That appears to be a perversion of this post, which points out that network plans have a degree of interdependence that limits how much they can be revised without falling apart. People who need me to be a villain imagine me saying “my way or the highway,” which is nonsense. Plans get revised a lot through public consultation, and that’s a good thing. His company, Jarrett Walker [and] Associates, is very comfortable with the neo-liberal mantra of user-pays, and a strong commercial imperative underlies much of its design work. Bonus points if you can figure out what text of mine was misread to fabricate this, because I can’t think of one. I have always advocated heavy state subsidy of public transport. As for commercial, that’s a confusing term that I never use myself, because it gives the impression that the only reason to serve lots of people is greed. (Tip: Sometimes you do it because you want to improve lots of people’s lives.) And even so, of course, I don’t bring an imperative to carry lots of people, because I encourage each city to think about the ridership-coverage tradeoff. My quoted words are indeed the only words I sent to Mr Louisson. I was trying to establish that it would not be interesting to interview me, because I could tell him nothing about what had happened to transit in his city in the last six years. Does this make me “behind” a revised plan, implemented without my involvement or even my knowledge six years later? And does my unwillingness to comment on something I know nothing about license a reporter to just make up stories about who I am and what I believe? Remember, if you don’t want your name dragged through the dirt in the media, it’s an easy thing to avoid: Say nothing. Do nothing. Propose nothing. Change nothing. That’s why nothing gets done. Auckland: The New Bus Network is Complete! This response is spot on. Newsroom usually do pretty good journalism so this is very disappointing from them. This just means you’re a BIG enough name now that it behooves someone to raise their own profile by trashing you. After reading both items, it seems to me that you tried to design a new bus service even though you have no formal qualification to do so. Clearly, it was not fit for purpose, and now that it has been implemented, you are trying to distance yourself from it. At some point in a career, Sean, professional experience matters more than what you studied in school. I’ve been designing public transport networks for 25 years, with great success, so I think I’m past that point. 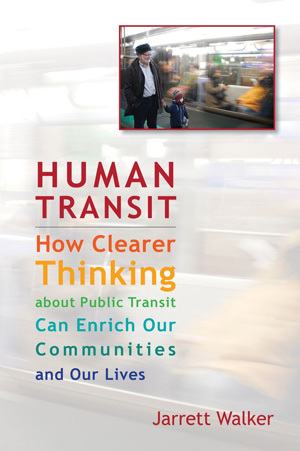 Human Transit is very clear 1) plumbers questions occur often 2) We have 7 demands for transit. Jarrett I think problems can occur when follower of your teaching fail to remember the plumbers question continuum. They then celebrate strongly reaching certain points such as Frequency- even if coverage has dropped. I had personal experience what I presume was one of your followers. At a scheduled presentation day I presented my work increasing a bus service from 5 to 47 per day. It was not perfect as sometimes people were left behind. Rarely I caught it off peak, at one of those times at 1130 it was over full and had to leave passengers behind. I presented how similar buses could be run on new routes . I was told “connections” were the answer and given no chance to reply. My bus connected with every train line, the central bus station and two of the cities largest stations.The next speaker whispered in my ear ” They did not listen to a word you said”. What can we do.? Well listen to others, Not blame the person but break down to ideas and contest those. Also be great Jarrett if you could “Wordsmith” the seven demands into 1 to 2 word phrases. I would like to see them promoting a new network rather than actions to support them as I feel this would help people stay better on target. You are not the only one who is getting blame in the wake of the busastrophe. Basically everyone involved is being blamed (the local council, the government, the bus companies and so on). And besides Uber drivers (who are ecstatic about the bus network redesign) journalists of course are also happy to get click-bait-articles out of this. 1) It seems you do not take into account local politics.Your contract was with the Greater Wellington Regional Council (GWRC) which is responsible for PT in the region and has a majority of suburban councilors outside the city. The suburbs are not interested in PT in the city (for which the redesign was) except that it should be cheap (in fact, the suburbs want a four-lane highway through the city center to the airport (“four-lanes-to-the-planes”)). This was your choice though. Of course any knife can be used for good (e.g. food processing) or bad (e.g. stabbing people) but to whom you give the knife (a cook or a criminal) is your choice. So while it is true that the issues are mostly caused by our GWRC this is something you could have noticed before taking the contract… (btw, the GWRC sees nothing wrong with the implementation, they would do it the same way again, so they probably feel slandered by you (if they would notice you, which I doubt)). 2) I read through the original report on the redesign which as far as I can tell has no (passenger) capacity planning or modelling. This is one of the big issues with the redesign, the plan aggregates demand onto lines which were already at capacity and now those are overloaded. This leads to transfer passengers standing in the rain watching buses passing them by. This relates to 1). In my opinion a redesign makes only sense if the redesign will support robust PT growth (and I would go further, it should stimulate growth, i.e. induce demand). A plan which just reshuffles the network and reduces services to save cost is not what the PT users were expecting. 3) I also miss anything in the report about required changes so that transfer penalties are kept low (besides making transfers free). As mentioned above Wellington is still addicted to cars which means that the GWRC manipulated a spine study which came to the conclusion that Light Rail makes no economic sense and BRT should be chosen. For a while the network change was being labelled as BRT but of course exactly zero requirements for a BRT network have been implemented so they dropped that label. A bus has no chance to stick to any schedule in Wellington (unless you pad the schedule with a lot of buffer which would make them painfully slow). Your report did mention some of these issues (e.g. how bus throughput on the golden mile is impacted) but you did not state that the golden mile should be made car free. I guess you already had that as a restriction from the car-addicted council. 4) You reject any of the implementation mistakes as having nothing to do with you but as I stated in 1) you made the decision to get a pay check from a car-addicted council to redesign the network. So they took your findings and so that they can get the same coverage with a lot less buses and the council took those elements to save 5 million NZD on the yearly operating costs with the new plan. This is something the suburban councilors can sell to their voters and to them the redesign is a success. The councilwoman responsible for transport showed up only to one public meeting on the bus network, after which she said that she found the behaviour of community members at the meeting unacceptable and skipped further meetings. And as stated above the GWRC thinks the implementation was just fine. Some bus commuters have transferred back to cars or walking. (In theory that will solve the congestion on the spines of course, if ridership on PT is reduced to a level where you remove more buses from the network). Having more car riders of course will mean more voters for additional roads, which the cynic in me thinks was the goal all along by the GWRC. The implementers seem to have noticed the (passenger) capacity issue so they introduced double decker buses on some lines (the Karori line doesn’t since it goes through tunnels, and that line has the most capacity issues (with full buses) and now has really bad congestion in the rush hour with the additional cars on the road caused by the network redesign). Those double decker buses make the Golden Mile bus congestion worse since loading times on those are really bad. Transfers are now free, so this recommendation from your design was implemented. Increased frequencies mentioned in your design have been not implemented as suggested. Evenings and weekends look still bleak (in fact the buses I used to take on weekends for excursions have been scrapped with no replacement).